What I find is that he did not acknowledge his wife after all these years, couldn't he at least look or smile at her? Sad he ended his reign like this, very sad indeed! The affection between JC and son and Sofia and son doesn't seem fake to me. Same with JC and the girls. But it is striking to see no interaction between JC and Letizia or even Sofia and Letizia. None. No hugs, no eye to eye contact. It's very sad. Or maybe your way of putting it is best...it leaves a very unpleasant impression. That no longer makes any difference. 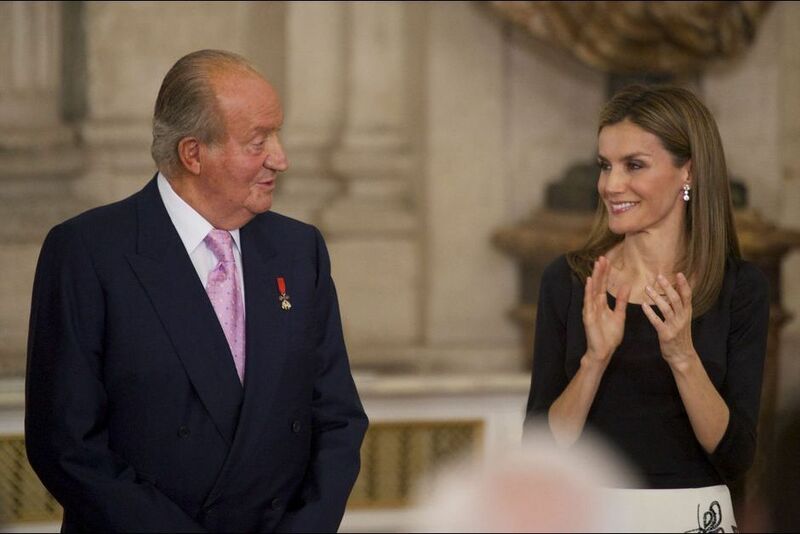 Letizia is now Queen and that is where Felipe wants her, or she wouldn't be there. That really was a sad sight but what did we expect. If all of a sudden they showed extreme love and embraced, that would have been sickening and fake. Plus, I don't think that many Spanish royals show too much love emotion in public, except towards children. I wasn't expecting extreme love and embrace but a gentle and elegant kiss on the cheek from both of them. And what I mean from this is not them showing their love to the people but just a gesture to thank one another for all the years they've been serving Spain. I agree that would have been very sweet, but who really knows what goes on behind closed doors and that was probably the best they could do. Shame after years of marriage and serving their country. My feeling is that everyone seems to be very tense and am not really sure of what to do next. I am more surprised that Elena was not helping to guide the 2 Infantas despite sitting next to them.. I thought the process in such event would be carefully planned out. Yet I find that it's strange that Felipe and Letizia have to gesture to the girls openly to come forward for the embrace. Couldn't Elena been briefed to guide them just as per how Beatrix been engaging Amalia during the Dutch investiture? But instead, Letizia has to be constantly looking and guiding her girls throughout the ceremony when she was seated in front. I do not think it was planned for the girls to come over and kiss their grandfather. Felipe is seen whispering in Juan Carlos' ear and nodding towards the girls, then I think JC looks over at them and F then gestures for them to come over. It is the same with the balcony scene, where it was not planned for everyone to start kissing each other. After looking at the pictures a couple of times, I wonder if most there where not really believing what was going on and that they were all in a daze, sleepwalking type of state of mind.........This was highly emotional and very tense, it seemed like everyone wanted to be some place else. Queen Sophia looked the saddest of all, I so feel for her, she must be hurting because after all she has spent her entire life with JC and he doesn't even acknowledge her with a look or smile. She really stepped up to a higher place when she acknowledge JC and kissed him on the cheek. A very grand lady for sure! The girls looked like they were in dream like state of mind..........not sure of everything and yet so calm and dignified at the same time. King Felipe, he looked like he was ready to take over right then and there and still having feelings of *is this happening*, Letizia, oh she is the only one wide awake and knows all that is going on, fully aware of this time and place. Where would the king and queen reside now that there's a new king?